With the approach of Chinese New Year, a majority of Chinese are going back to their hometowns for the year's most important reunion. For unmarried couples, it is tradition to bring significant others home to introduce them to the family for approval. For expats dating Chinese, this is a big moment - meeting the parents. The first introduction could be a dreadful experience for unprepared laowai, or it could be a pleasant memory with the proper effort put into winning over the family. 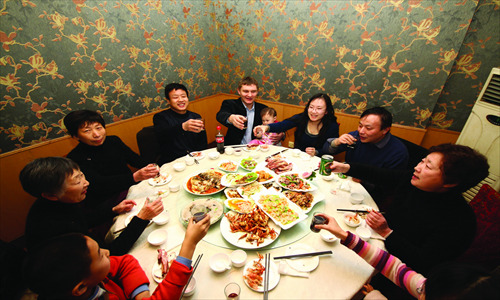 Richard Hay, a Beijinger in his 40s, met the parents of his then-girlfriend (now wife) directly after a 10-hour flight from London. He recalled the experience, now 10 years ago, as a dramatic, horrific encounter. Visiting Beijing on summer holiday, he decided it was a good idea to meet up with his girlfriend's family since he was in the country. Expecting a causal meeting, he arrived at a big dinner of 10 family members, with the poker-faced father and smiling mother sitting at the center. Hay struggled to master picking up food with chopsticks. Then came the language problem. He spoke little Chinese, and his girlfriend, who was too busy and excited talking with her family, had no time to translate. He just sat and smiled. "The thing that I found really strange was that people kept asking me when we were getting married," he said. He hadn't expected such questions from the family of a woman he had dated for less than a year. "If you're meeting the [Chinese] parents, it means you two cheng le (have made it), which also means marriage is in the near future," said Xu Yue, who offers relationship advice to both Chinese and expats while spending her time in Beijing and New York. "Although the Chinese culture is constantly evolving away from these traditions, meeting the parents is not to be taken lightly." Though Hay was accepted by his girlfriend's parents on the first meeting, he was later told the mother spent a night weeping over the prospect of her daughter marrying a foreigner. Language can play a key role in the meeting, wrote Jocelyn Eikenburg, an American writer and blogger from Ohio, in an e-mail interview with Metro Beijing. She is married to a Chinese from rural Zhejiang Province. Eikenburg's husband thinks her ability to speak Chinese helped change his parents' minds about him dating a foreign woman. "While I wouldn't say that all Chinese parents necessarily have negative stereotypes about foreigners, some do. If you can communicate with them, that goes a long way in winning over parents," said Eikenburg, who pens the blog "Speaking of China" about cross-cultural dating and relationships. Eikenburg, who first came to China in 1999 to work as an English teacher in Henan Province, was invited to her then-boyfriend's home for the Spring Festival of 2003 after they had been dating for less than a year. Before the meeting, she learned that her now-husband’s parents were fine with their son being friends with a foreign woman, but not dating one. She grew extremely concerned, but went ahead with the meeting. "I definitely felt the pressure to win his parents over, especially with my husband's father, who was the one who vocalized the opposition to our relationship," said Eikenburg. "At first, I really didn't have much of a conversation with either my husband's mom or dad - beyond them asking me if I wanted something to eat, or showing me around the house, for example." Then came the ice breaker. "Once I took out the [family] photos and began talking with his father, I felt so relieved and excited to finally connect with someone in the family," she recalled. The first meeting for Rob Welham, a British photojournalist and writer, went smoothly even though he couldn't speak a lick of Chinese. Welham and his Chinese wife visited his parents-in-law in Kaiyuan, a small village in Yunnan Province, shortly after they got married in the UK in 2006. Despite his appearance - he wore a long ponytail and dark-colored glasses - he was immediately liked by the family after being introduced to them. "They are nice people and her mother was particularly excited. My wife did all the translation for me and her mother and I spent much time going through her collection of Mao memorabilia, and she gave me a lot of badges," said Welham, who now resides in London with his wife. Despite going through a hangover from baijiu toasts at the Chinese wedding ceremony of over 100 guests, Welham remembered the experience fondly, and said that he and his wife now visit the in-laws every year. Being the only foreigner to have married anyone in Kaiyuan, Welham said he just won over the parents by being "my usual self." Meeting the parents doesn't have to be as hard as some fear, noted Eikenburg. "To a major degree, it also depends on your Chinese partner. Having a supportive Chinese partner in your corner, as I did, can really make a difference," she said. Don't give in to pressure to meet the parents around Spring Festival if you and your partner are not ready. Communicate your relationship status to your partner as early as possible. Don't forget to bring gifts for the whole family, paying special attention to gifts for the elders of the family. Ask your Chinese partner for suggestions. When in doubt, pass out those beloved red envelopes (hongbao) to anyone who is either not married, not working or younger than you. Being a good guest can go a long way. Remember that at dinner, the most important (and oldest) family member always sits in the chair facing the door. The youngest should pour tea throughout the meal, making sure no one's cup ever goes dry. In China, unmarried couples traditionally don't touch. That's especially important to keep in mind for foreign women, as they can quickly be condemned as "too casual" or "loose." Bring along photos of your family, hometown or travels around the world to get the family interested and talking. The language barrier can almost be an advantage when the expat is ethnically non-Chinese. Parents love hearing laowai try to speak Chinese, and may even help out with some new vocabulary words.